If you ever wondered how to protect your rooftop from standing water or heavy rain that can flood all our furniture, don’t worry about it anymore as the perfect Glendale shingle roofer has arrived! Arizona Roof Rescue is prepared to protect our precious Arizona citizens with the best Glendale shingle roof installation on the market at the most affordable price, ready at all times and available for you just a call away! If you don’t know what is the exact issue with your roof, we will personally go wherever you are and thoroughly inspect and find out what can we do to protect it whether we have to replace or repair your shingles. With over 40 perfect reviews on Angie’s List and HomeAdvisor, over 100 positive reviews on Better Business Bureau and 5 stars on Yelp, Arizona Roof Rescue is the best valued Glendale shingle roofing company in the business. Don’t hesitate to reach us at our contact information if you want to find out more about Glendale shingle roof repair. One of the promises we do with our customers is to always stay as the honest and punctual Glendale shingle roofer we have always been. Arizona Roof Rescue’s team will be more than happy to repair or replace the singles you need in our residential or commercial property. Glendale is a growing suburb of Phoenix. It’s a great place to settle down and buy a home or start a business as there is excellent potential for real estate values to go up as the city continues to grow. Your roof is one of the most important parts of your home. In Glendale, the extreme temperatures in the summer can threaten the integrity of your roof. Arizona Roof Rescue employs experienced Glendale roofers who can diagnose and repair any issues that your roof is experiencing to help protect the structural integrity of your home and reduce the risk of more extensive and expensive damage. 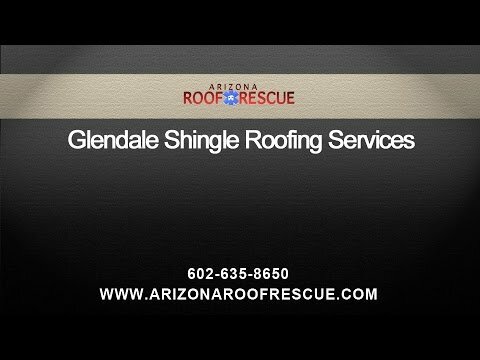 Glendale shingle roofing requires a bit more care and attention in Arizona. The hot summers can cause the shingles and the underlayment to crack and crumble over time. Even minor deterioration can lead to small leaks that can cause major damage. It is important that you have your roof inspected regularly – at least once a year – to detect these issues at their earliest stage and to prevent serious damage. Arizona Roof Rescue can help you protect the health of your roof and your home. Every Glendale roofing contractor on our team has experience working with shingle roofing. We can perform the routine maintenance and diagnostic checks to catch problems early, and we can conduct any necessary repairs quickly and expertly. We can also install a new roof if you’re current roof is aging out or if the damages are too extensive to make repair practical. Is your Glendale home in need of quality roofing services? Whether you’re in need of a full new roof installation, re-roofing, an ongoing maintenance contractor, or emergency repairs, the professional roofing contractors at Arizona Roof rescue can help. Call Arizona Roof Rescue in Glendale today to find out how we may be able to help you with your shingle roofing. We offer a free estimate of services, and our team is fully licensed and insured. We have the experience and the training you can trust to create a healthy roof for your home or business. If you want to repair or replace any part of your roof, and you are looking for an expert Glendale shingle roofer, you have come to the right place. We have the expertise in fixing and substituting bad or broken shingles with new ones, guaranteeing the durability of them over the years. If you need more information about our services, you can give us a call at any time. Whenever you find your house getting flooded, water stains on your furniture or water leaks, all this probably means that your roof is damaged and you are going to need a Glendale roof repair. You don’t have to do this alone, Arizona Roof Rescue has the knowledge to identify and repair the area that requires the most attention in a fast manner. All types of shingles have their own lifespan, whether it is foam, concrete, asphalt, every material will reach a point when they start to look out of place or rusty, and you will have to change all of them for a new roof. Arizona Roof Rescue in Arizona is specialized in Glendale shingle roof installation with the knowledge and experience to do it in the fastest speed possible, guaranteeing you to have the most durable roof of all your neighbors.